Raise your hand if you never make lasagna because you think it’s too difficult. Come closer, my friends. 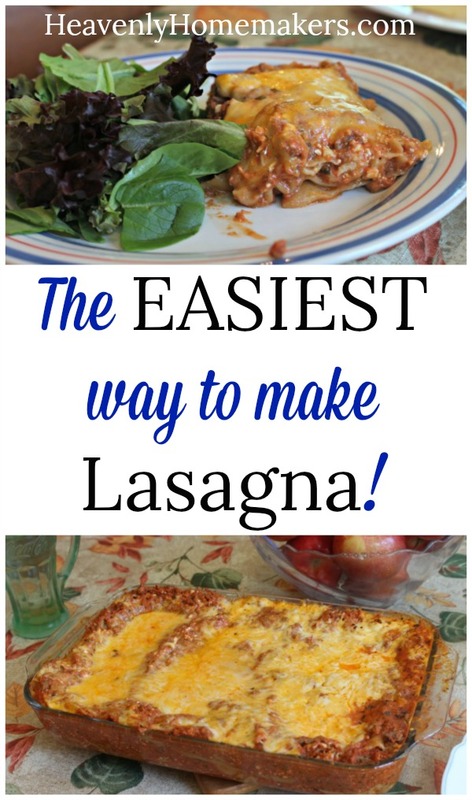 Allow me to let you in on a few secrets so that you can learn the easiest way to make lasagna for your family and for guests! Ten years ago when I first launched my website, this was a recipe I included in my first cute little eBook series. 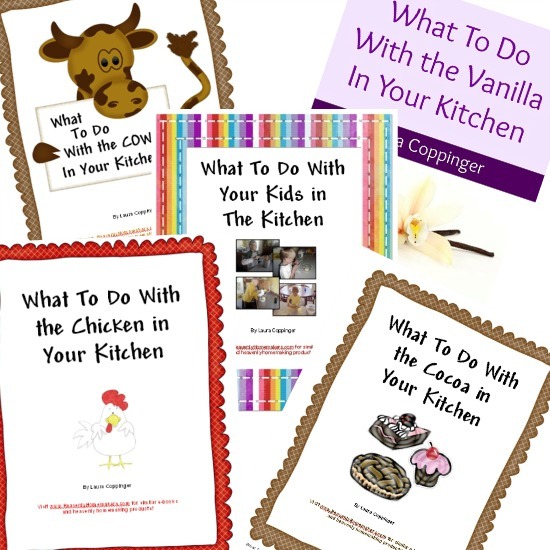 I’ve since taken these eBooks out of my shop and shared most of these recipes on my blog. 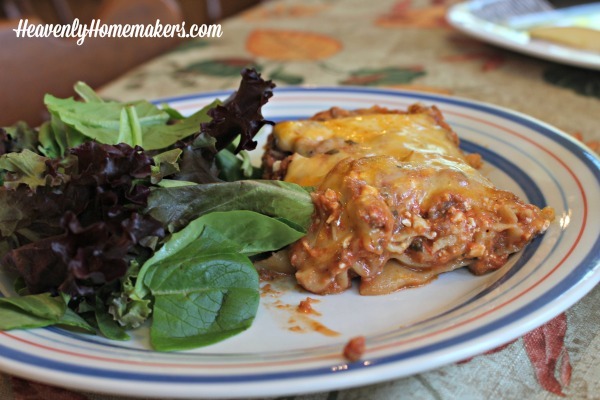 But somehow, I failed to ever share this recipe for The Easiest Lasagna!! Awww. Remember these? Precious memories. Until now. In celebration of 10 years of blogging, it is a must that I finally tell you my secrets for making the easiest lasagna on the planet. Forgive me for waiting this long. Your life will be better now that you can make lasagna with so little effort. Your family will be so happy! Trick #1: Do not cook the lasagna noodles ahead of time. Simply lay the dry noodles in the pan and layer them with the sauce and cheese. Drizzle about 1/2 cup of water over the lasagna before baking and cover with foil. The water will cook the noodles while it bakes. Easy! Trick #2: Stir the cottage cheese into the sauce instead of working in vain to spread it onto the noodles as you create layers in the pan. This makes no difference in the taste, but it sure does alleviate a challenging step in the lasagna-making process! Trick #3: When making one lasagna, for the love of all things simple, make two or three. It takes no extra effort to do this! 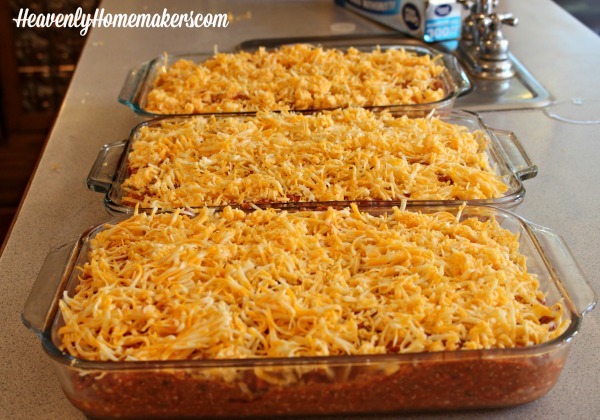 Then you can put the extra lasagnas into your freezer to effortlessly bake another day! In a large pot, cook hamburger meat with onion. Drain grease if necessary. Stir in pasta sauce and salt. Lay ⅓ of the lasagna noodles (uncooked) to cover the bottom of a 9x13 inch baking dish. Pour ⅓ of the sauce mixture over the noodles and spread to cover the noodles. Sprinkle ⅓ of the shredded cheese over the top. Drizzle ⅓ cup water over the lasagna. 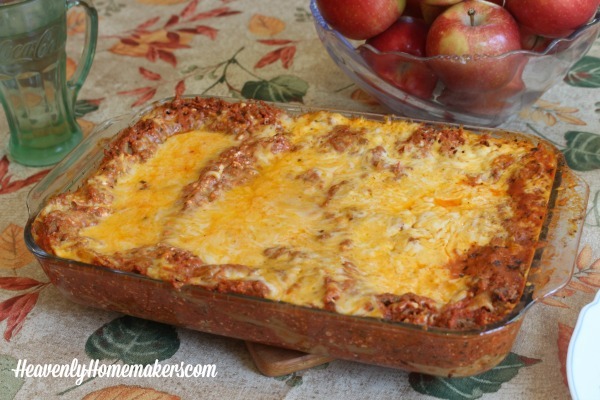 I can think of no better time to make this Easy Lasagna recipe! 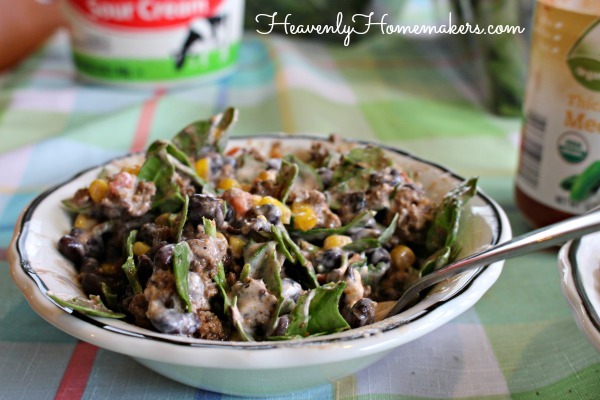 This is a fabulous meal to have in your freezer during these busy holiday weeks. In addition, Lasagna is a wonderful meal to feed guests! Get your ingredients rounded up, and crank out some Lasagnas!! If you’d like to watch a video of me making three lasagnas, here you go! See how easy this is! Now, can anyone tell me why Lasagna is spelled with a “g” in there? I may have figured out ways to make this dish simple, but I have yet to learn why it is spelled so silly. Woohoo! 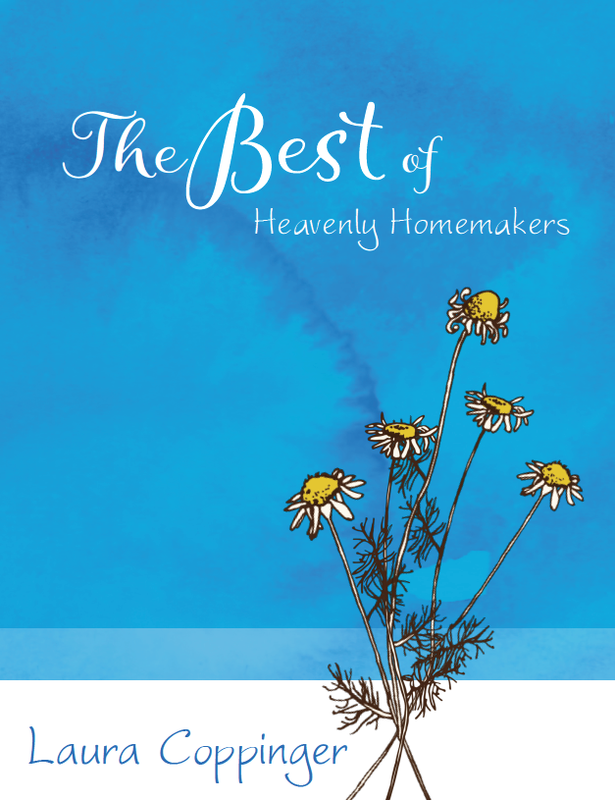 In honor of our 10-year Heavenly Homemakers anniversary, be sure to pick up your very own printed copy of The Best of Heavenly Homemakers!! Am I getting enough bang for my buck, here? As in, is the time I’m taking and the energy I’m extending to make all of this food really saving me money and therefore, is it worth it? For the record, homemade mozzarella costs more than store-bought. 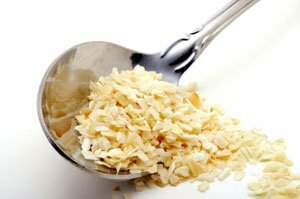 Now, sometimes it’s worth putting forth the effort or spending more to make food from scratch because of the health benefit and great flavor. I mean, I don’t even care how much it saves or doesn’t save to make Homemade Ranch Dressing because this recipe tastes thousands of times better than the bottled stuff and it only includes healthy ingredients. I don’t want high fructose corn syrup on my salad. But as my schedule has gotten busier and as the quantity of food we plow through every day has increased, I’ve had to be more choosy about what I make, what I buy pre-made, and what I skip altogether. For instance, I used to make all of our Whole Wheat Tortillas, without fail. These taste amazing and we miss them, but it takes triple the amount of tortillas to get us through a meal now, compared to the days my kids were little. It’s a rare occasion that I “go to the trouble” to make tortillas now, because it takes over an hour to get the job done. (Though when I do, there is much rejoicing.) We either skip tortillas now (often subbing corn chips), or I’ll buy a case from Azure Standard to keep in the freezer. Having said all of that, today I thought I’d share some recipes I’ve stuck with for all these years, even with a busier schedule and a higher volume of food consumption. These recipes are worth my time, because the time investment is tiny. And they are cheaper than store-bought so they are a win-win! Also, homemade always tastes better, so score one more for that! 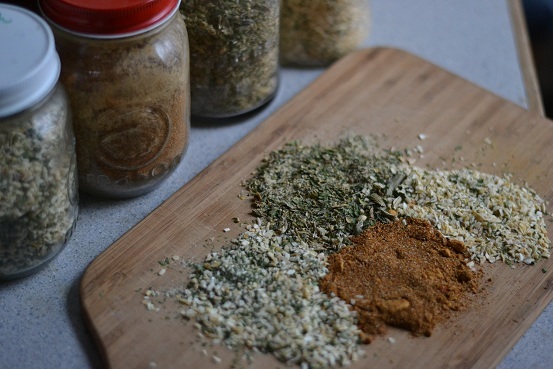 I make all of our Ranch Dressing Mix, Italian Dressing Mix, Onion Soup Mix, and Taco Seasoning Mix. These cost pennies to make, saving a significant amount. And since I make big batches, the time saved on these is great! 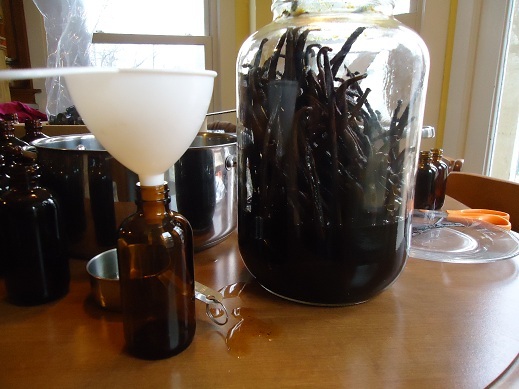 The price of beans has gone up, but it still saves money to make Homemade Vanilla Extract. It’s ridiculously easy to make, and well worth the effort because homemade vanilla is amazing! We don’t eat as much bread as we used to at our house. I think it’s wholesome and filling and my family loves it, but I prefer to fill everyone with more nutrient-packed sides like fruits and veggies. So bread has taken a back seat at our house. I do sometimes buy a loaf of 100% whole wheat sandwich bread for sandwiches when we need to pack them for a road trip. 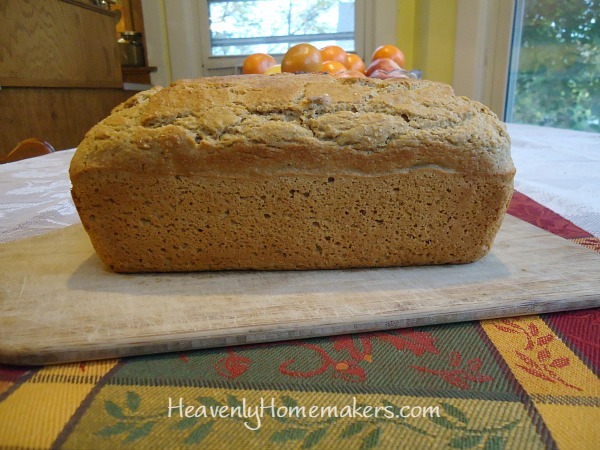 But for bread at home, when as do eat it with a meal, I make this Stir-and-Pour Whole Wheat Bread. It takes hardly any time or effort, and it doesn’t cost very much. And it tastes awesome! I discovered this 5-Minute Granola Method and haven’t looked back. I add in whatever we have (dried fruit or chocolate chips) and we’ve got ourselves a great cereal for much less than store bought! 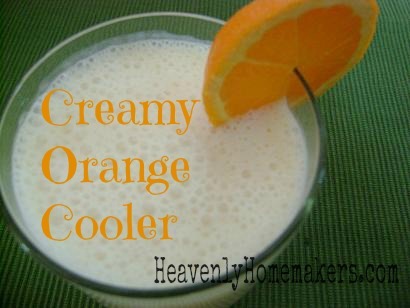 This is ridiculously easy and so super yummy! Throw three ingredients in the blender and you’re set! It’s a rare thing for us to spend $$ at a coffee shop since we can make fun coffee drinks at home for much less! This Chocolate Frappe is awesome. Sometimes we put this Chocolate Whipped Cream in our coffee. We freeze coffee into ice cubes like this to make easy Iced Coffees. This Coffee Milkshake is awesome in the summertime. Sometimes I make a big batch of Chocolate Iced Coffee to offer several people at once. While all of these take a little time, it doesn’t feel like a lot of effort because it’s FUN to make drinks like this! 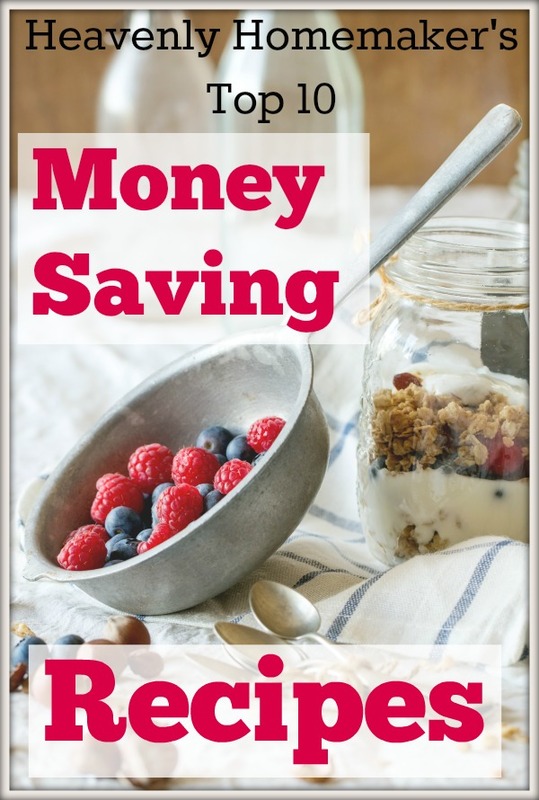 What are some of the foods you make from scratch that are easy and save money? Did you get your Money-Saving Freebies yet? Remember that anyone who signs up to join our FREE Heavenly Homemaker’s Savings Club gets both of these freebies sent to them. Fun!! Sign up here, confirm your subscription, and both booklets will be in your inbox very quickly! 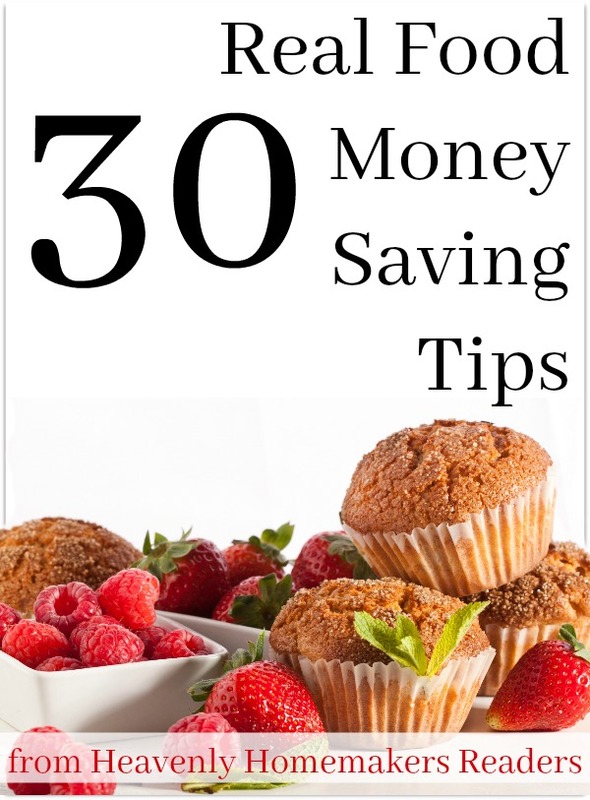 Then we can keep you informed of any other money saving tips and deals we come across! 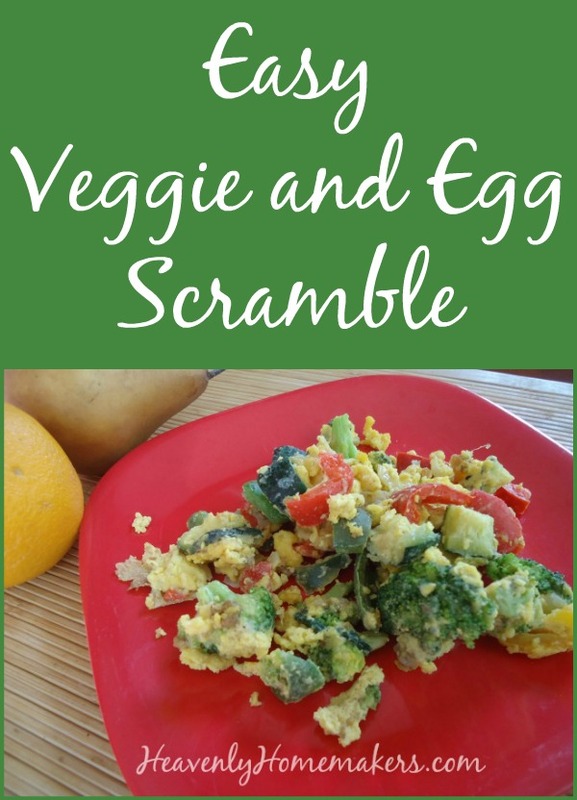 I think this Veggie-n-Egg Scramble might become one of my favorite and most relied upon go-to meals. I used to make something like this years ago, but kind of forgot about it. Weird how that happens. A few weeks ago, I needed a quick meal before we headed out to a soccer game. I didn’t have time to cook meat, but I did have a fridge full of veggies and a few dozen eggs. I called the boys into the kitchen and started throwing vegetables and knives at them. Hold on. That didn’t come out right. I didn’t throw knives at them. (Peppers maybe, but not knives.) I’m just saying I started handing out jobs and we all worked together to make this quick and nourishing meal. All the veggies are good in this Veggie-n-Egg Scramble, but I will suggest that onions are a key player. 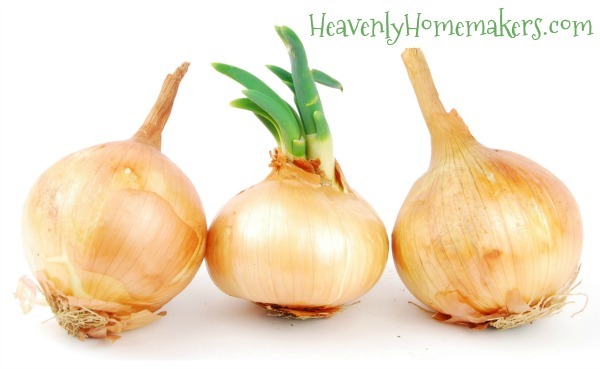 Onions give this dish such amazing flavor! Sweet peppers are a close second. Broccoli, asparagus, zucchini, and spinach come next. The beauty is that you can use whatever veggies you like and whatever you have on hand. Saute the veggies in olive oil or butter until tender. Scramble in some eggs with salt. Toss in a little cheese for extra amazingness. So much deliciousness. Very little work. Extra wonderful nourishment. Saute vegetables in oil or butter until tender. Meanwhile, crack eggs into a bowl and whip with milk. Pour egg mixture over cooked veggies and salt as you like. 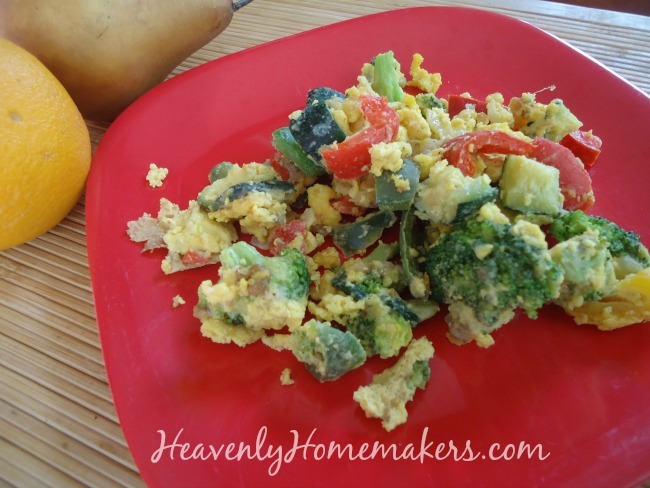 Scramble the eggs with the veggies until they are cooked through. Sprinkle cheese on top to melt. I at least double this for my family of 6 big eaters. Plus we serve it with fresh fruit. Buttered toast also helps fill them up. Seriously. We really do eat and keep eating at our house. TIP: If you happen to have leftover ham or bacon – even chicken or beef – hanging out in your fridge, those would be a wonderful addition to this dish. This meal has become one of the easiest ways to get my family to eat a big variety of veggies in one meal. It ranks right up there with Easy Noodle Stir-Fry. Do you ever make a meal like this at your house? What veggies would you or do you include? It’s meals like this that make “teaching our kids about nutrition” quite natural. Here’s what we’re going to do. 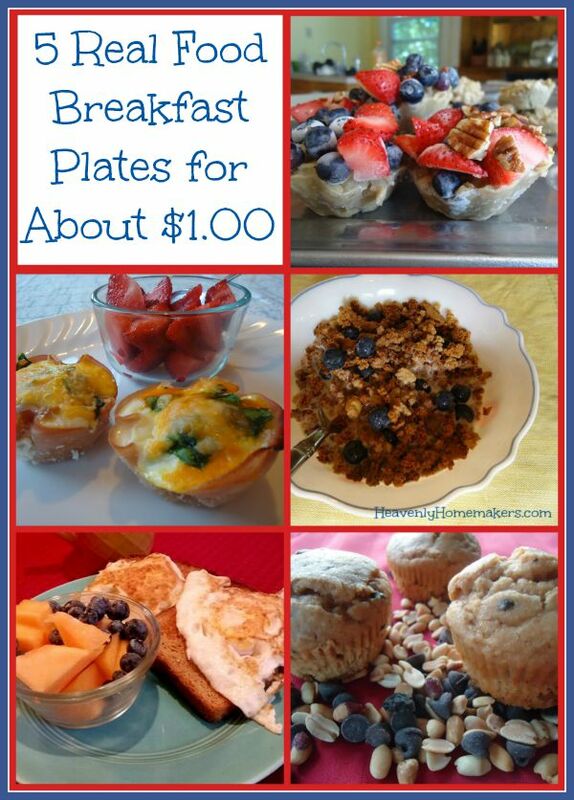 We’re going to put together five different real food breakfast plans that are super simple and cost about $1.00 per plate. 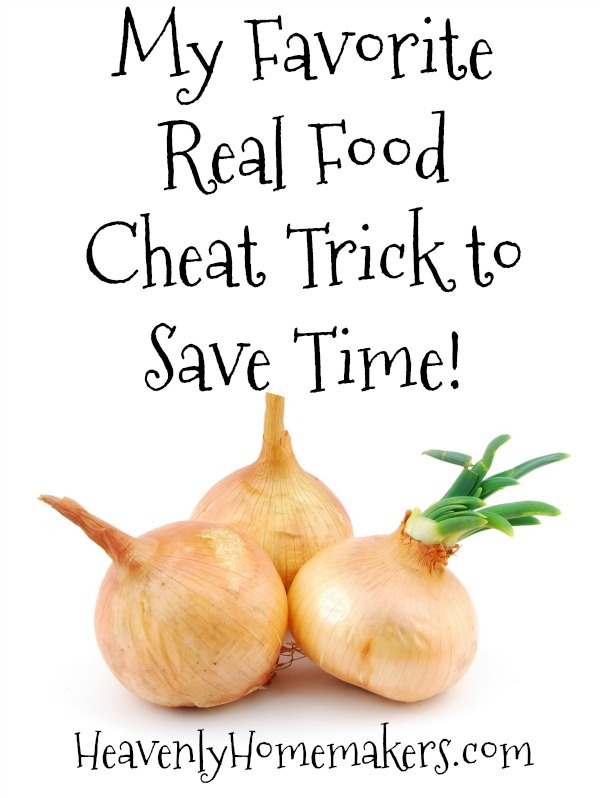 We’re going to save money, save time, and eat well…all at the same time. Other Disclaimers: Your costs and my costs are not going to match up exactly. Fruit prices fluctuate, so I recommend price-matching (if it is an option for you), ordering from Bountiful Baskets or Azure Standard (if it an option for you), and buying in season and on sale. I love that this meal can be prepared and put on the table in such a short time – and that is so packed with nourishment from protein to vitamins to minerals. 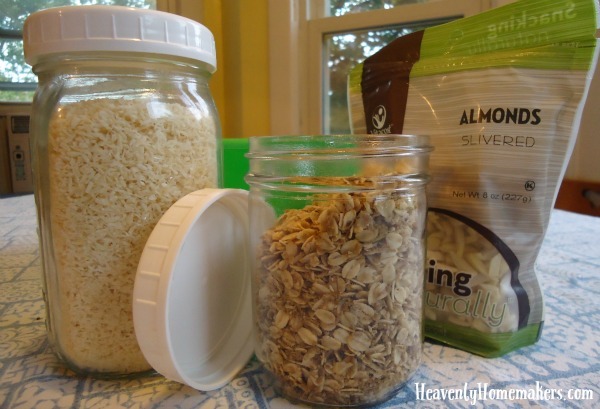 Make this inexpensive meal easier than ever by making ahead Instant Oatmeal Packets or Frozen Oatmeal Cups. Add any fruit you have, whether fresh, frozen, or freeze-dried. Make muffin batter ahead as described here, then bake in the morning. So easy! Scramble or fry some eggs. Throw frozen fruits into the blender for a smoothie. Voila! Our favorite smoothie recipe is: Pineapple Mango Smoothie. It is so delicious! We also love Green Machine Milkshakes and Creamy Orange Coolers. 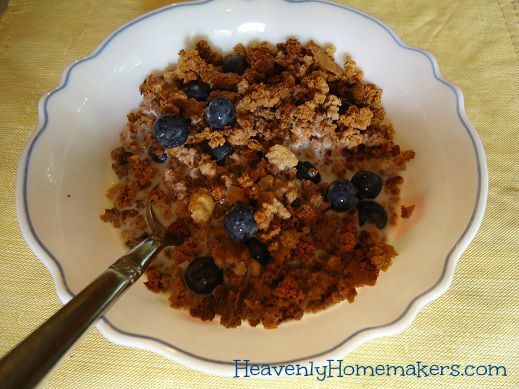 This is super easy to make ahead of time, and the cereal is very filling! Throw berries into your cereal bowl or eat fresh fruit on the side. Need some protein to finish this off? How about a hard boiled egg? Perfection. My family can’t get enough of these, and you can make them according to your veggie preferences. These can be made ahead and re-heated in the morning if you like. They are great for a grab and go breakfast! 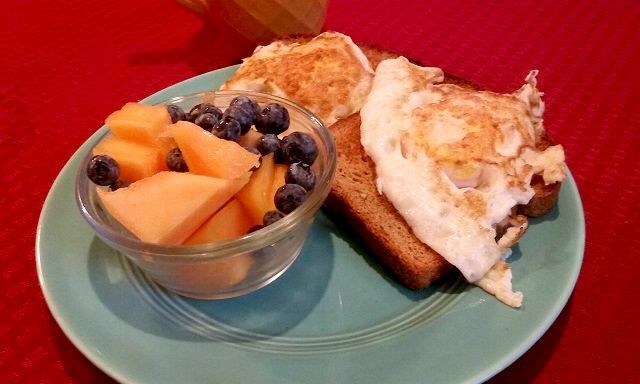 I’d love to hear what your inexpensive real food go-to breakfast plates look like! Because my wheels are turning now, I feel like I could put together another post with an additional 5 Breakfast Plates for About $1.00. I’ll see what I can come up with – and I’d love to include your ideas too! 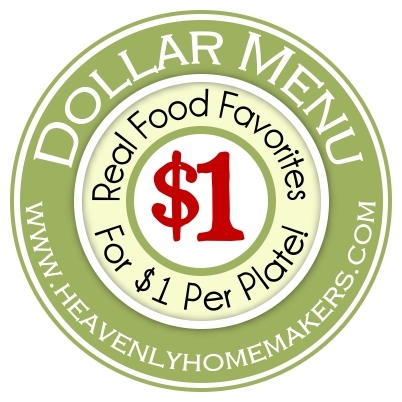 Huge savings here —> Check out our amazing Simple Meals program! Knowing my day was super full: school and website work throughout the day; piano lessons for Malachi at 10; soccer for Matt, Asa, Justus, and Malachi at 2; grocery shopping for Elias and me at 2; someone coming by to pick up a co-op order at 3:30; friend coming over to study with Asa at 4; Bible study at 6:30 – and did I mention there’s a “ready to be assembled” shower in my living room and plaster dust all over my house right now?? Well, I knew I needed to stay on top of meals if we were going to actually eat today. Today I decided to make Easy Noodle Stir Fry for lunch and Taco Salad for dinner. I gave the meat a stir from time to time. I answered a question about an English assignment, drank a few swigs of water, and threw some blueberries into my mouth for a snack. I put water in a pot to boil noodles at noon. I got out the noodles. I dumped mixed greens into a big bowl, poured in cheese I had shredded Monday, and tossed it all around with the freshly cooked taco meat. I mixed up French Dressing for the Taco Salad. At 10:26 I ran out the door to pick up Malachi. With all the major prep work done for our day’s meals, at lunch time all I had to do was turn on the stove to cook the prepared veggies and boil noodles. At dinner time all I had to do was get the prepared salad out of the fridge, dice some tomatoes (which I picked up at the store this afternoon on my grocery run), and get out the tortilla chip crumbs I’ve been saving for such a meal as this. I also cut up a pineapple to complete our evening meal. That took two minutes. Now you tell me. Is it really so terribly time consuming to prepare healthy food? I think not. What are some of your quick-to-prepare meals that pack a punch with nutrition? 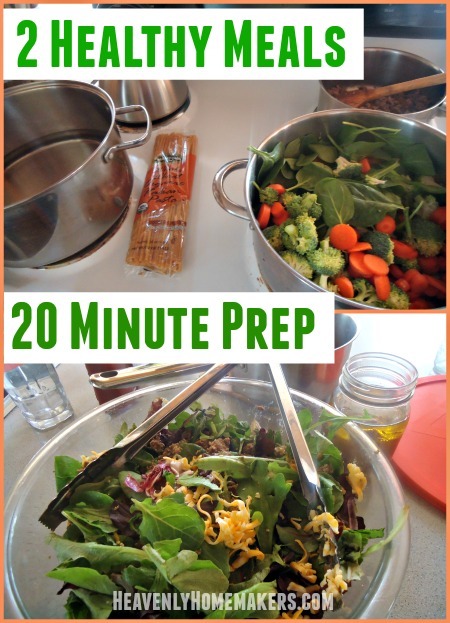 Have any great “prep-ahead” methods to share with us? Join the fun! Check out our amazing Simple Meals program! This will save your money, save your energy, and give you back more time to spend with your family. You will love this! It’s true. 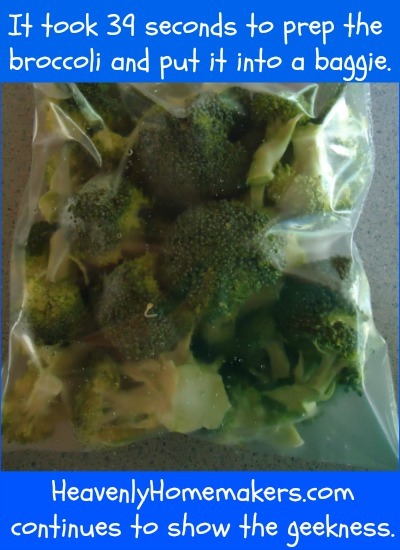 It takes 47 seconds to prepare broccoli for the steamer. 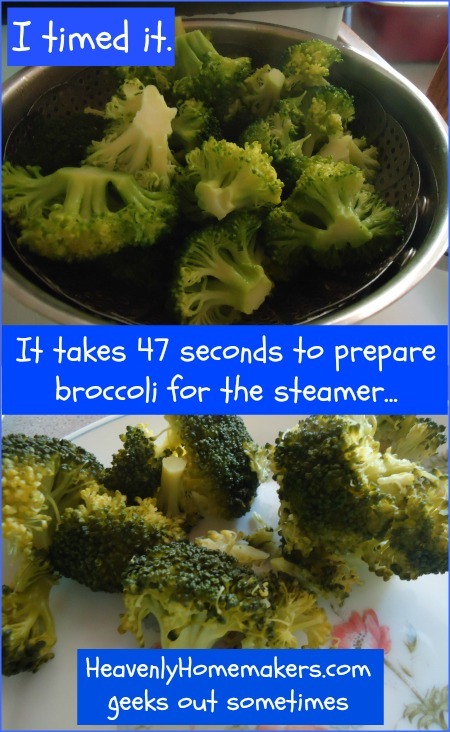 I know this because I timed myself preparing broccoli to be steamed. Why are you looking at me like that? You would do something this geeky too if you heard people say, “making healthy food takes too long to make” as much as I do. I figure, I can keep saying, “does not, huh-uh, does not” or I can actually time myself making healthy food and prove people wrong with a stop watch. I felt this information was worth documenting as sometimes even I don’t feel like I have the time to make healthy food. Sometimes I feel that it would take less effort and time to slap down something less than stellar from the freezer section of the store. Sometimes I don’t want to go to the trouble to put something nourishing on the table. Me. 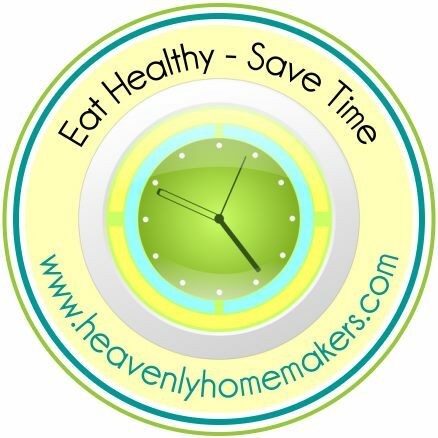 The one who knows the truth that healthy eating doesn’t take extra energy or time. Me, the one who has already proved this truth many times over. Me, the one who loves to cook. Now that you and I have learned the 47 second truth, neither of us can fall back on “I just don’t have the energy to make anything healthy tonight.” Even if we are compromising by putting something on the table that is less than stellar (hey, I do it sometimes too when I’m in a pinch or when we just want a fun treat). That’s fine. Throw down a take-and-bake pizza or whatever. Just take the additional 47 seconds to steam broccoli or make a salad to go with the meal. Once you’ve done that, you can pull it out of the fridge and take the remaining 8 seconds of the 47 seconds total broccoli prep time to pour it into your steamer and turn on the burner. Seriously people. It takes more energy to do all the math on this than it does to actually just go prepare the broccoli. Get out pot, run water into the pot, place it on the stove. Set the metal steamer into the pot of water. Get the broccoli out of the fridge. Wash the broccoli under running water. Cut the broccoli off the stem directly into the steamer on the stove. Put the lid on the pot , turn on the burner, and walk away. I believe we can all agree that preparing broccoli (or other veggies) is incredibly fast and easy and none of us has any excuse to not make them, serve them, and eat them. Now how many of you are going to get out the stop watch tonight as you make your vegetables? You might read this little time saving tip and say, “Hey, it takes the same amount of time to prep veggies no matter when you do it. This isn’t a time saving tip at all.” And yet, in an effort to save us all from walking wearily into our kitchens at 5:10, with no motivation to peel a carrot, much less prepare an entire healthy meal – I felt this was worth mentioning. While you still have to get this work done sometime during the day, at least this does save a few minutes of effort at meal time. Following this simple method is always so helpful to me. My day is a big mixture of schooling, working at the computer, doing household chores, cooking in the kitchen, and keeping up with the kids’ activities. I often hop around from math, to mixing up a recipe, to history lessons, to answering emails, to phonics practice, to putting lunch into the oven, to helping with an algebra question, to answering the door, to responding to potential website advertisers. You can see why I always give people a deer in the headlights look when they say, “So what does your schedule look like?” Schedule? I don’t have one. I just work and parent and parent and work all day. I love it. Every day is different, yet it is very much the same. The kids know what they need to get done. Matt and I know what we need to get done. Our routine is un-scheduled. Yet one thing is pretty constant about our days: From about 3:00 to about 5:00 in the afternoons, the kids take turns having their “play Minecraft on the computer time” while Mom tries to write something that includes helpful information and complete sentences. Therefore, section 4 line 8 of the Coppinger Household Rules Handbook states: “Do not interrupt Mom while she is in writing mode unless one of your brothers just blew up.” Since “Do not blow up your brother” is printed in large, bold letters at the beginning of section 2, I think we can all agree that there should be no reason to interrupt Mom while she is in writing mode. Okay then. I tell you all of this life in the Coppinger house information for one reason: As I pull out of writing mode and back into the hungry people will need to eat soon mode, I find that I am slightly weary and brain dead from thinking, making decisions, and working all day. I do not feel like cutting broccoli into cute little trees. I am not excited about preparing cauliflower for roasting. I do not want to do anything in the kitchen but the bare minimum. This is where all my Getting Ahead in the Kitchen practices are invaluable. The kids get to come in and help get dinner on the table (their reward for not blowing themselves up during my writing time). And since I’ve already prepped the veggies earlier in the day, all we have to do is roast them, stir fry them, or steam them. Hallelujah! So the Eat Healthy, Save Time tip of the day is this: Sometime while you have ten minutes during the day, prepare vegetables for steaming, roasting, stir frying, eating raw – or however you’re going to serve them at dinnertime. Cover and put them into the fridge for later. (Hooray for Pyrex bowls with lids!) Pull them out and cook them quickly for dinner. Not home much during the day? I’d suggest doing some prep in the evening before bed. The next day, after you get home from a day at work, school, or running errands – pull out your prepared veggies to cook with your meal. 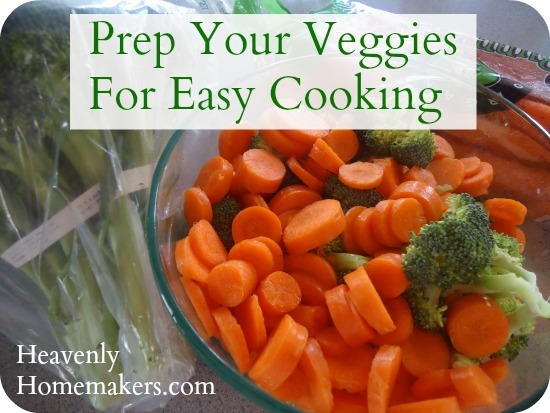 Prepping veggies doesn’t take long, and it isn’t difficult. But it is something that we have to be intentional about – otherwise we’ll likely skip the veggies…again. Don’t do it. Focus on the veggies (section 13 line 4). Prepare them when you have a few spare minutes for effortless, brainless dinner prep later. Then, not only have the kids avoided blowing themselves up, our bogged down brains have not exploded either. It’s a win-win. 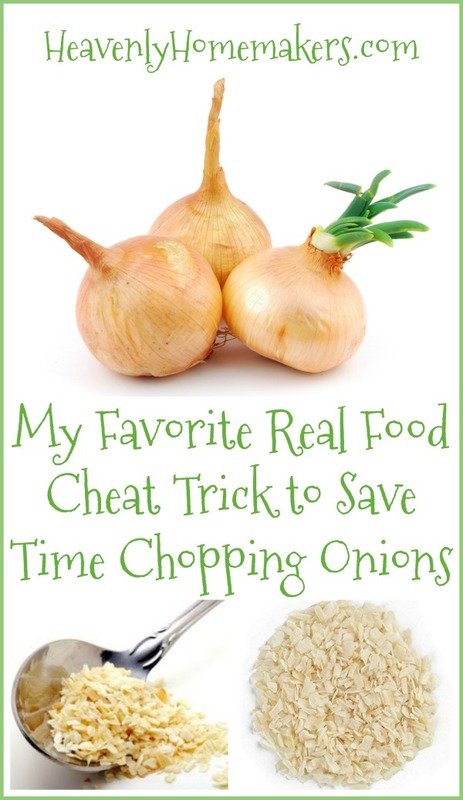 Want to know one of my latest tricks as I work to keep life simple (but still healthy) in the kitchen? 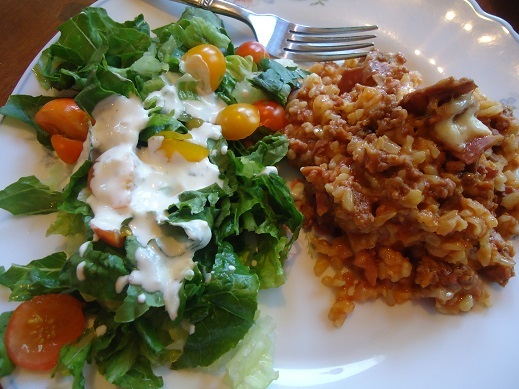 While I’ve been working to have main dishes prepared ahead of time – when it comes time to serve the meal, we need a salad and/or veggie to go with it. No problem. 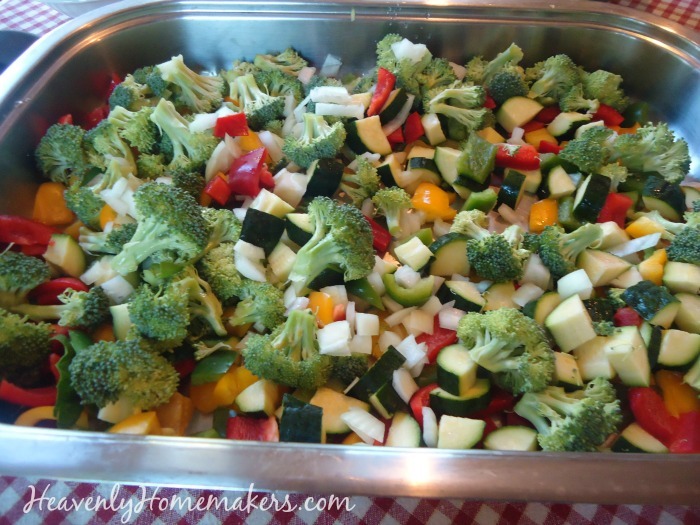 Steaming veggies or tossing a salad together is super fast and easy. But here’s what’s even faster: Throw down all of the salad fixings and let everyone make their own salad. Is it just me, or does it appear that someone really should fill those empty jars of salad dressing? 1. I had prepared a casserole last week and put it in the freezer. 2. At 4pm, I put the frozen casserole into the oven, turned the oven on to 250°, and let the casserole thaw/bake for two hours. 3. I wipe the sweat off my brow after that laborious twelve seconds of hard work. 4. At 5:50, I realize the casserole will soon be ready, so I decide to get out salad stuff. 5. I ask one boy to wash lettuce, another to wash tomatoes, another to get out salad dressing. 6. The casserole is taken out of the oven, the salad fixings are out, and everyone comes to the kitchen to fix a plate. 7. Each of us takes a scoop of casserole, then grabs some lettuce leaves. 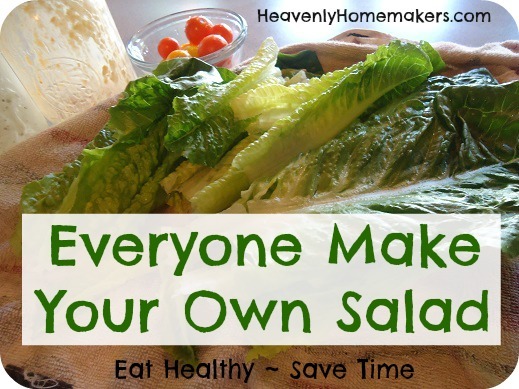 We all tear our lettuce onto our plates, grab tomatoes, choose our dressing, then sit down to eat together. Even very young children can tear their own lettuce for a salad. And what kid doesn’t love being given permission to tear, rip, break, or shred their food? It’s like a salad eating privilege. This message brought to you today by the Stop Giving Excuses About Not Having Time To Eat Healthy Food Foundation. This make your own salad idea fits perfectly with our new Simple Meals program! Your meal prep is just about to become much, much easier. You’ll save money, too. You, too, will become obsessed with muffin batter after you read this. Muffins. They are everywhere. I can’t seem to stop myself. If you could look into my freezers right now, you might wonder if I had an unhealthy fear of an impending muffin shortage. 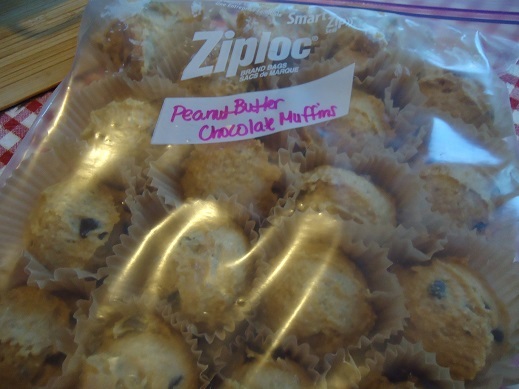 Or that perhaps I was planning to feed muffins to my family every meal for three weeks and then force ziplock bags full of leftover muffins upon the mailman and the unsuspecting neighborhood boy walking his dog . You might wonder if I am planning a bake sale, featuring all varieties of muffins, baked by the happy, grinning muffin lady. The practical side of you might also wonder if I’d recently found chocolate chips on sale. At our house, muffins and chocolate chips often go hand in hand just because they do. We shall blame this latest muffin craze on Vicki – a reader who has now changed my life, or at least my breakfast. I’m telling you right now: Get out your muffin tins, paper liners, and mixing bowls. 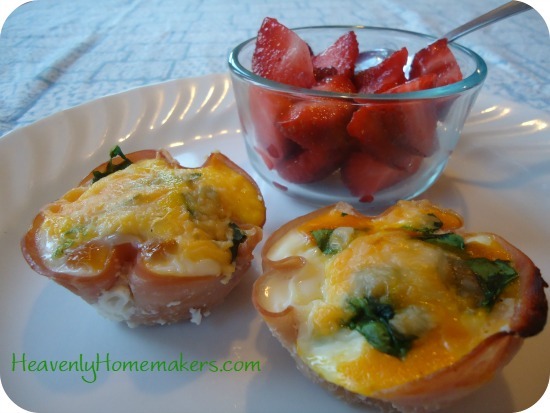 You will want to partake in this time saving, delicious, breakfast and snack baking activity. Stir up your muffin batter as the recipe states. (You’ll find many muffin recipes here.) Scoop the batter into well greased or paper-lined muffin tins. Do not bake. Freeze. (Not you, the muffins. This is not a hold up.) Once the muffin batter is frozen, take the frozen batter balls out of the tin and place them in a freezer bag. Store them in the freezer for up to three months. 2. 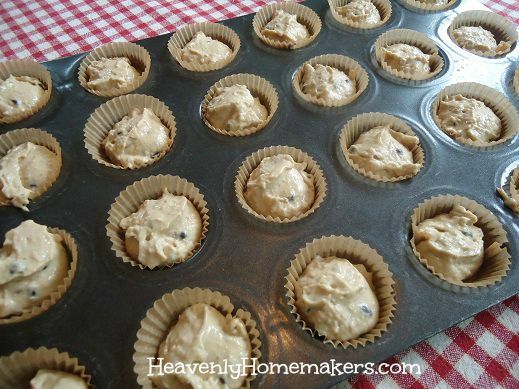 Place frozen, unbaked muffin batter balls into muffin tins right when you need them, bake as directed, only adding a few more minutes of baking time. It’s not like it’s hard or time consuming to mix up muffins and bake them. But I’m all for cutting down on dishes, and getting food made ahead of time to make life and healthy meals more convenient. 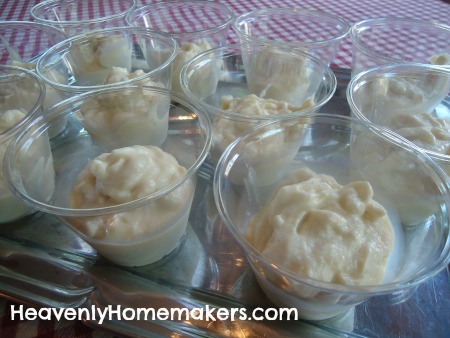 This wonderful muffin batter freezing tip rocks my world – and fills my freezer with dozens of muffins in many varieties. It also saves me money and effort. I can’t tell you how many times I’ve made muffins, stuffed them in the back of my freezer for a busy day, then pulled them out only to find them freezer burned and dry. This freezing method ensures I have fresh, tasty muffins every time – within minutes and without dirtying dishes. 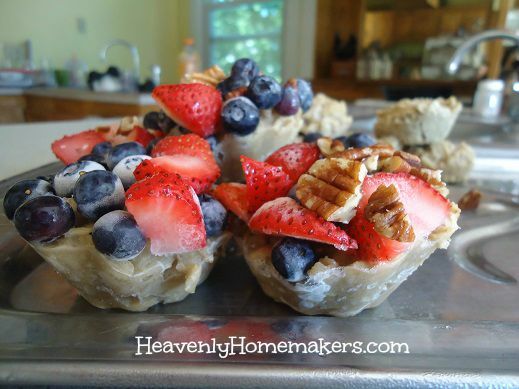 If your batter is thick enough, skip freezing it in the muffin tin. 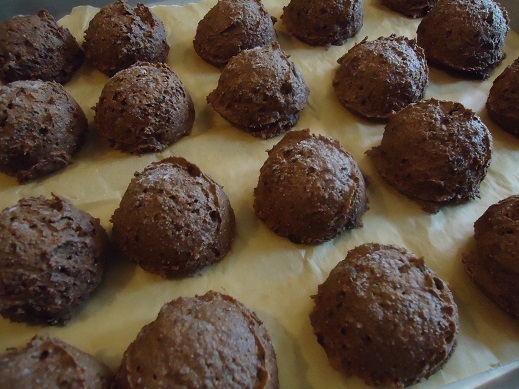 Scoop the batter in muffin-sized balls onto a parchment paper-lined cookie sheet. Transfer frozen balls to freezer bags and use when needed. 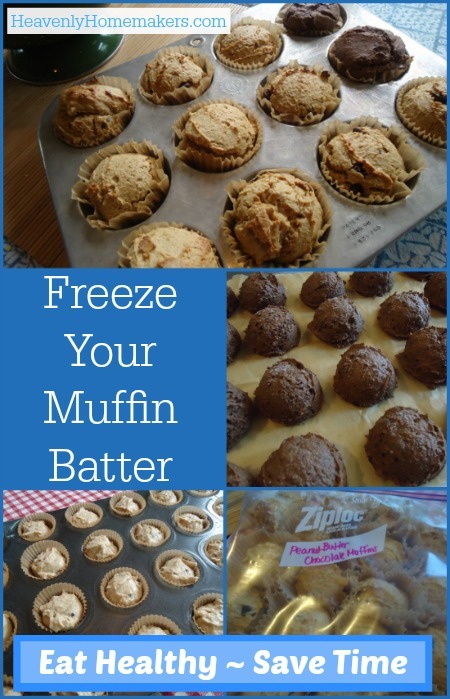 Label your muffin batter balls so you can easily tell what is available in your freezer. If you have several different varieties of muffin batter prepared and in your freezer, you can pull out a few of each kind and bake an assortment, just for fun or to please picky palates. This idea even works for mini-muffins. Because I have muffins on my mind, I have more fun muffin tips coming up this week. (Subscribe for free updates if you don’t want to miss!) 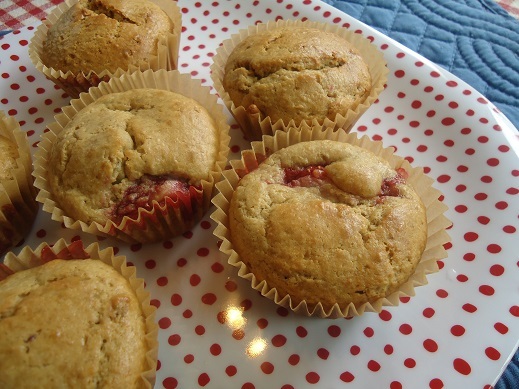 And be watching for an awesome Strawberry Cream Muffin recipe too! I have to know: Is this “freezing muffin batter” a brand new idea to you, or have you tried it before? Once I tried this and learned how well it worked, I went on a muffin freezing frenzy (as confessed above). I now have Chocolate Chocolate Chip Muffin batter, Blueberry Muffin batter, Chocolate Chip Muffin batter (recipe in Kids in the Kitchen eBook), and Peanut Butter Chocolate Chip Muffin batter in my freezers. Told you I couldn’t stop myself. What a time saver!